KALAMAZOO--A playwright and director known around the globe will be the next featured guest in the Gwen Frostic Reading Series at Western Michigan University. Carlos Murillo, an internationally produced playwright and director, will read from his selected works at 8 p.m. Thursday, Nov. 17, in Room 157 of the Bernhard Center. Murillo is perhaps best known for his play "Dark Play or Stories for Boys," which premiered at the Humana Festival in 2007 and has since been produced throughout the United States and in translation in Hungary, Germany, Chile, Poland and Slovakia. His other plays include "A Thick Description of Harry Smith," "Diagram of a Paper Airplane," "Unfinished American Highwayscape," "Mimesophobia," "A Human Interest Story," "Offspring of the Cold War" and "Schadenfreude." Murillo's plays have been seen in major venues in New York, Chicago, Los Angeles and throughout the United States. His awards include the Goodman Theatre Ofner Prize, the Otis Guernsey Award from the William Inge Festival, two National Latino Playwriting Awards and the MAP Fund grant. 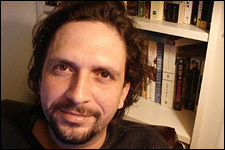 Murillo is a resident playwright at Chicago Dramatists and New Dramatists in New York City. He is currently working on commissions for Steppenwolf Theatre and Playwrights Horizons. As a teacher, he has been a visiting artist with the Kennedy Center and the Iowa Playwrights Workshop. He is an associate professor at The Theatre School of DePaul University where he heads the playwriting program.